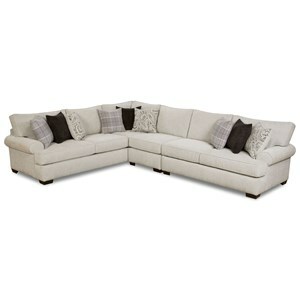 This sectional will give your living space an extremely comfortable and stylish seating option. The clean lines and track arms give the piece a contemporary look, while the plush seat and back cushions and accent pillows provide a comfy, casual touch. This sectional will be perfect for enjoying a movie with family or hanging out and catching up with friends. The 7100 Five Piece Armless Sectional Sofa by Huntington House at Thornton Furniture in the Bowling Green, Alvaton, Glasgow, Scottsville, Franklin area. Product availability may vary. Contact us for the most current availability on this product. 7100-51 Armless Chair 2 40.5" 45" 36"
7100-31 Corner 3 45" 45" 36"
Fabric Options Available in a variety of fabric options through custom order. Tailoring Each frame is upholstered by an experienced craftsman with great attention to detail. 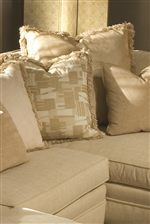 Layers of cotton batting and pre-formed rubber are used throughout the frame for unseen form and luxurious comfort. Matched down the front, over the arm on down to the skirt, and over the back down to the skirt on frames with a straight rail. Leg or Skirt Exposed square wood block feet. Wood & Finish Items can be custom ordered with a choice of over 20 wood finish options on exposed wood. Frame Construction Kiln dried hardwood lumber is used for the foundation of each frame. All frames are cut precisely and assembled by hand using select 5/4''hardwoods, which are then joined by glue and double-dowels to strengthen and reinforce the frame. The 4 corners of the frame are reinforced with corner blocks which are glued, screwed, and stapled to the frame, a process that triples the strength and stability of the frame. All frames are sanded along the edges to create softer lines and eliminate hard edges that over time can be abrasive to upholstery material. Seat Support Real 8-Way hand tied coil spring system, made the old Fashion way. Using “Steel bands” and “Hour Glass” shaped steel spring construction. Padding & Ergonomics The Ultra Down (UD) cushion, standard on many styles, feature a high-resiliency polyurethane foam core with layers of lower compression polyurethane foam on either side. This composite core is wrapped in a layer of Dacron polyester fiber and a feather and down blend. The cushion is then sewn into a down-proof ticking. The 7100 collection offers high quality construction and elegant contemporary style. This sectional collection is made in the USA, with sturdy and durable hardwood frames, supportive 8-way hand tied coils, and premium cushioning to keep you comfortable as you relax with your family and friends. Add a sectional from the 7100 collection to your home, for an instant style upgrade in your living room or family room. The 7100 collection is a great option if you are looking for Contemporary furniture in the Bowling Green, Alvaton, Glasgow, Scottsville, Franklin area. Browse other items in the 7100 collection from Thornton Furniture in the Bowling Green, Alvaton, Glasgow, Scottsville, Franklin area.